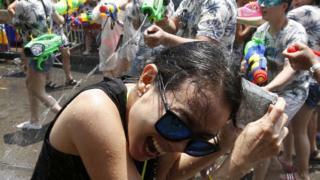 Thais are celebrating this year's Songkran festival, also known as the Buddhist New Year. The festival, held between 13 and 15 April in Thailand, is also celebrated in Laos, Cambodia and Myanmar. 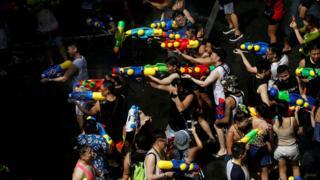 Songkran is often referred to as the biggest water fight in the world. Images from across Thailand show large crowds of people taking part in festivities. 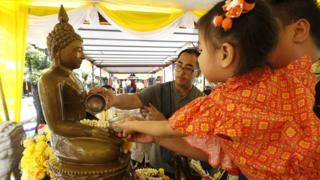 The holiday was traditionally marked by visiting family members and pouring water over Buddha statues. 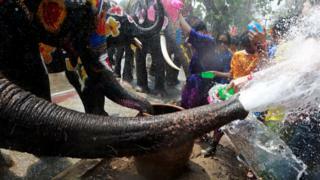 In this image, people sprinkle scented water over a Buddha statue. Throwing water is meant to wash away bad luck from the previous year. In this image (above) elephants and people can be seen spraying water. 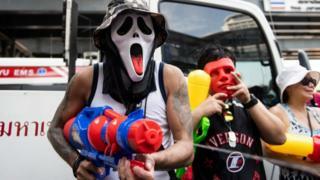 Hundreds of thousands of tourists head to Thailand every year, mainly to Bangkok and larger cities to experience Songkran. Many people can be seen in bright floral clothes as they take part in the celebrations. 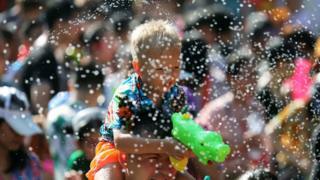 In this image (below) a young boy sits on a person's shoulders as he is sprayed with water. On 15 April, the first day of Thai New Year, people gather at temples to offer food and new robes to the temple monks.